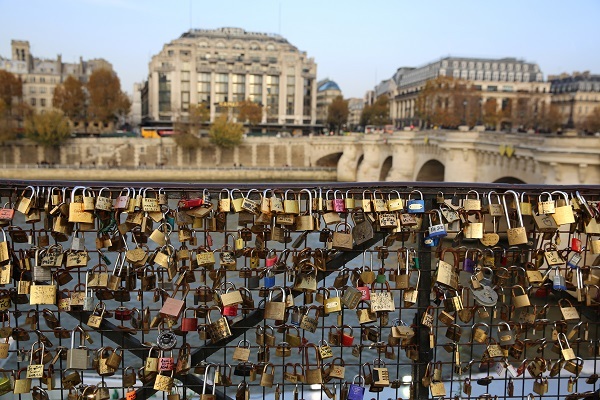 These love locks aren’t around anymore, but they are still an iconic part of France! Last week, we talked about famous fences from around the world. From the longest fence in the world in Australia to a unique aquatic fence in Turkey, there are so many ways that fences can stand out. Here are a few more famous fences that you may have heard of! Have you heard of a love lock? It’s a lock with the initials or names of a couple. The couple fastens the lock to a fence and throws away the key to symbolize eternal love. 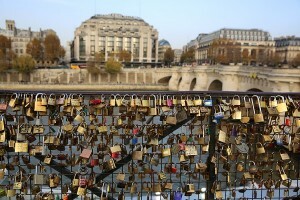 There are several love lock fences around the world, but the most famous is in Paris, France. The famous Pont des Arts bridge in Paris, France had a whopping 45 tons of locks fastened to it! That’s over a million locks! Unfortunately, the weight of the love locks caused a 6.5-foot section of the bridge’s iron fencing to collapse in June of 2014. A year later, all of the locks were removed and lock-proof plexiglass installed over the metal grating. In New Zealand,there are actually several fences with random items attached, ranging from shoes to teapots to toilets. But one of the most famous fences out of all of these is the bra fence in Cardrona. Bras have been mysteriously populating this wire farm fencing since 1999. The fence has drawn thousands of tourists to the area. How about famous fences at home here in the USA? Our most iconic fences are ones that are associated with our national sport: baseball. Fenway Park, home of the Boston Red Sox, is famous for its extremely short right field fence. The 302-foot fence gives batters an advantage, which is why Fenway is also known as a “hitter’s ballpark”. Over in California, Giants fans can watch the game from a boat in McCovey Cove, peering right over the San Francisco Fence of the AT&T Park. This entry was posted on Friday, October 14th, 2016 at 7:43 pm. Both comments and pings are currently closed.